Overflowing closet? Check. Wrinkled clothes? Check. Favorite handbag MIA? Check. On a budget? Definitely, check! You need a creative way to maximize space and bring order to the fabric jungle of your closet. Custom closet organizers can cost between $1,000 and $5,000. Do-it-yourself kits range from $75 to $600. The wonder hanger is a simple and affordable closet organization idea. This cascading clothes hanger organizer increases closet space by enabling you to stack clothes vertically. 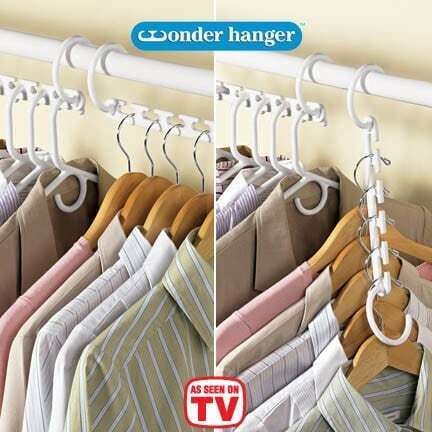 Each wonder hanger holds 5 wood, metal or plastic hangers. There are 8 wonder hangers to a package – enough to hang 40 garments – designed to be used together in the same closet to maximize space savings. Unlike traditional cascading hangers, there is no garment wrestling with the wonder hanger. This clothes hanger organizer’s patent-pending open mouth design allows you to easily add or remove your jackets, skirts, pants, and shirts. It is also strong. Supporting up to 20 pounds, it can hold up to 5 heavy winter jackets. The wonder hanger can transform your closet. You can use it to group complete outfits or similar items, organize by color or season, and hang handbags or belts. You will be able to quickly find wrinkle-free clothes and accessories.